- Look for a proportionate head and neck (the head should be smaller than the neck) for optimal balance, maneuverability, and athleticism – it makes a difference to a horse and can make a horse more prone to being on the forehand or hind end. - A long neck provides strength (via a longer Longissimus, which is what allows the horse to scrunch their body up and then stretch out as they propel themselves forward), balance, and a longer stride. - Eye shape and placement matter!! - You should be able to place a fist between the lower jaw bones (in the nook of the horse’s throat, where it attaches to the neck) if there is sufficient space for the horse’s trachea. - Teeth should meet – teeth issues can mean high maintenance down the road. - The throatlatch should be thin to allow for open airways, particularly when the horse’s head is tucked, and to allow for suppleness. - You should be able to fit two fingers between the Atlas (cervical vertebrae) and the jawbone for an appropriate head/neck angle, and the angle should be curved and not be abrupt. - The neck should tie in ABOVE the point of shoulder for optimal flexibility. With a high-tied-in neck, the horse is better able to lift its forelegs for a jump or for speed. The longer and higher the forelegs can reach, the more they can work to efficiently pull the horse forward and propel it onwards, in conjunction with the hind end. The cervical vertebrae are arranged in two “S”-shaped curves – one at the top (where head and neck meet), and one at the bottom (where neck and shoulder meet). The lower “S” curve should be shallow but gradual in its ascent. The upper curve should be long and gradual. Anything else allows for variations of ewe-necks, etc. 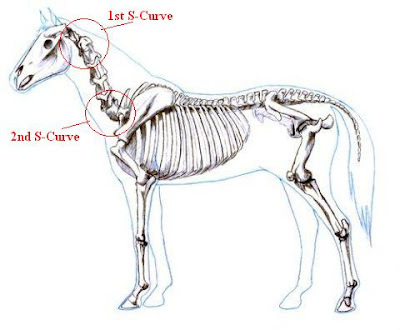 While a horse’s musculature can allow for some weakness in topline, the skeletal structure is what will make a horse truly ewe-necked or otherwise.